The area close to Bang Niang beach is quite flat and as a result the tsunami waves penetrated about three kilometers inland. But the rebuilding in Bang Niang was quite quick and now there is little physical evidence of the disaster. There is a wide range of good accomodation options, with some top-end accomodation near the south side of this beach. Bang Niang hosts local Thai food restaurants and stalls, and also the Talad Nat Bang Niang market at the northern end of Bang Niang - this is also a Night Market in the high season opening every day after 6.00 pm. But actually this market is rather random and little used. 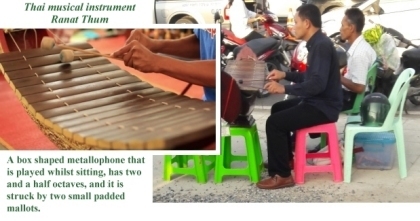 There is also the Talad Nat Po Piang market - this open air community market is opposite the Tsunami Museum and next to the 7/11 shop at Chong Fah beach Bang Niang; it is open on Monday, Wednesday and Saturday. It is simply called the Bang Niang market. In addition there is another open air community market on the open stretch of road next to the Build Factory club restaurant and bar, and opposite a small lake at Bang Niang. This market more or less alternates with the Talad Nat Po Piang market in terms of opening days. It is known as the Build container market (since it was essentially built from containers). It functions as a night market with small music bars as well as ad hoc market shops (5 pm till 11 pm) and a limited afternoon fresh market. There is also a Flea Market in Bang Niang on Sundays - a lot of street kitchen vendors and lots of clothes and souvenirs for a bargain. The area close to the police boat 813 hosts certain celebrations including Loy Krathong, and will have food stalls on such days. There is a small Thai Boxing stadium (twixt route 4 and the Mukdara hotel, and close to the tsunami handicrafts centre). Khaolak's bus station is also located at Bang Niang (northern end, close to the Khaolak City hotel, and behind the water reservoir). There is also a boxing stadium next to the bus station. The washed ashore police boat, no. 813, lies in the jungle to the east of route 4 (Petchakasem Road), at Chong Fah, Bang Niang. This boat now symbolises a small tsunami memorial site, and services for the tsunami memorial commemorations are held here. Specifically, Bang Niang beach is a 1.5 km stretch and lies between two rivers. The southern end, closer to the Bang Niang river, has several upmarket hotels. The northern end has clusters of small bungalow resorts, which are basically in two rows, parallel to the beach. Copyright 2003 - KhaoLak.net. All Rights Reserved. Web site design and creation by KhaoLak DotNet.